Do you suffer from dry eyes? Are you constantly putting drops in your eyes? I have a product here that may help you. It is an eye drop, but a longer-lasting eye drop that is fast acting, non-blurring and provides superior comfort. ROHTO Dry-Aid Dry Eye Relief Eye Drops are from the #1 Global Over The Counter eye care brand, they are longer-lasting dry eye relief versus the leading brand, they are fast-acting, non-blurring relief, soothing dry eye for up to 12 hours and they help relieve 5 key dry eye symptoms. How is that for some awesome eye drops? These eye drops have Liquidshield™ technology, and are uniquely formulated to help restore moisture to the tear film by working on all three layers to mimic a natural healthy tear. Fast-acting drops provide longer-lasting relief vs. the leading brand and soothe eyes for up to 12 hours!!!! The unique micro-emulsion formula delivers relief in a clear and non-blurring drop, so you can get right back to the things you love. There is no need to wait for the blur to go away, which is a common problem with other lubricant eye drops. These drops are also highly rated for their refreshing feeling. They have been clinically shown to relieve all key symptoms of dry eye including: dryness, irritation, grittiness, burning and stinging. ROHTO Dry-Aid brings fast-acting long-lasting relief for dry, irritated eyes due to overuse of digital devices, extended use of contact lenses, laser eye surgery, hormonal change or dry indoor or outdoor environments. My husband has to use drops due to some damage to his cornea and he uses them all day, every day. I had him switch out his drops for the ROHTO Dry-Aid Dry Eye Relief Eye Drops to see how he would like them. He used them for two weeks and told me how he felt about them. He liked them. He liked them a lot. Mainly what he liked is that is was not using drops all day long. He only used them 3x a day at the most. Usually he was using drops every 2 hours or so. He loved this. And he liked that they were fast-acting, non-blurring and long-lasting. My husband also liked that they alleviated all the symptoms of dry eye: dryness, irritation, grittiness, burning and stinging. That is huge, especially because he always feels like his eye is gritty. He really likes these drops and is willing to pay a little more for them. 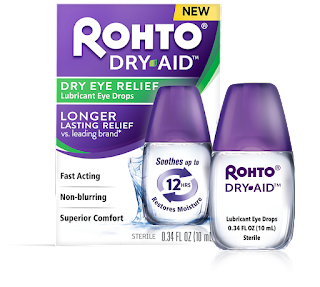 ROHTO Dry-Aid Dry Eye Relief Eye Drops can be found at www.amazon.com, WalMart, Rite-Aid, Target, Walgreens, CVS, Safeway, Kroger and The Mentholatum Store. Like ROHTO on Facebook: https://www.facebook.com/rohtoeyedrops; Follow ROHTO on Twitter:@rohtoeyedrops and Subscribe to ROHTO on YouTube: https://www.youtube.com/channel/UCZ6BSbWLr2-Tpmou47XTpSA.